Chris Davie died on January 8, 2019, at the age of 41. He was diagnosed with a grade 2 Glioma—a brain tumor—on the last day of 2007, when he had an unexpected seizure in the car with his wife Betsy and baby son Nathan, on their way to a New Year’s Eve party. It was a frigid Minnesota night; luckily, Betsy was driving. I know this is the real world, that this is terminal,” he recalls thinking, “but I am going to do my best to go 20 years.” Despite regular medical checks, life went on as usual, for the most part, for the next 10 years. But in 2017 the tumor started to grow again and, after a second brain surgery, the tumor was re-classified as a Grade IV Glioblastoma, a diagnosis with an average life expectancy of 15 months. The cancer was no longer “surreal,” as it had been for so many years. Suddenly, it was a reality with a frighteningly short time-line. Betsy Davie, Chris’ wife, contacted me by email in early June, 2018. She had learned about Health Story Collaborative after watching a live-streamed story event, co-hosted by CaringBridge, featuring Michael Bischoff, another patient living with Glioblastoma, and his neuro-oncologist, Dr. John Trusheim. Betsy and Chris resonated with Michael’s story and were motivated to reach out. “Chris is in a tough spot medically,” she wrote. We met in August to record their story. Chris was clear on his goals. He wanted to capture a record of his experience, to communicate what he was going through, what he had learned and what had been meaningful to him. Most importantly, he wanted his kids, Nathan, now 11, and Julia, now 7, to remember him and to know, deeply, how much he loved them and how much their love meant to him. During our conversation, he mentioned a song that has been important to his family—“The One Who Knows,” by Dar Williams. 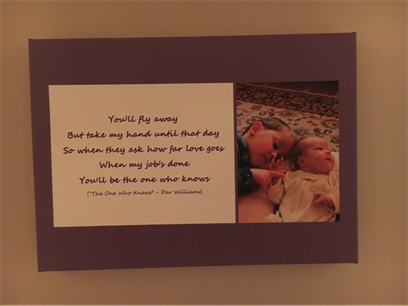 A quote from this song hangs on the wall in the hallway between his children’s bedrooms, where it has been for years. “You’ll fly away, but take my hand until that day,” it begins, “So when they ask how far love goes, when my job’s done, you’ll be the one who knows.” He knew that he would fly away first, before they are grown, but the message still pertains. While on his way out of this world, Chris worked actively and intentionally to deepen his connections and to make his love known. Michael is now part of the Health Story Collaborative team, our Healing Story Principal, guiding others in storytelling and leading by example. He has taught me that it is possible to heal even in the face of death. He has demonstrated the power of connection. If we fully own and openly express our vulnerability, the imagined walls that keep us separate often disappear. At Health Story Collaborative, our work centers on using storytelling as a therapeutic tool. We work closely with individuals navigating health challenges to help them construct and share their narratives in ways that are psychologically productive and empowering. Our approach is grounded in research supporting the health benefits of storytelling. We encourage the development of certain narrative themes that have been linked to improvements in mental health, namely agency, communion, redemption and coherence. But the people we work with keep it real. It is not always possible to have a sense of agency in the throes of illness. And not everything is redeemable. It can’t get worse than death. And yet, Chris and Michael, two men with Glioblastoma, a deadly brain tumor, have given me hope and inspiration. They remind me: it is not all or nothing. Even when death is imminent, we can look for threads of redemption and flashes of agency. We do what we can, and we do it with love. We nurture and celebrate our communities and connections. We give voice to what is in our minds and hearts. We expose our humanity. They remind us. If this isn’t healing, what is? Originally published on WBUR CommonHealth Blog on January 15h, 2019. Alicia has faced cancer more than once. She was diagnosed with Hodgkin's Lymphoma in college and has had to deal with both cancer recurrence and a new diagnosis of breast cancer since. More than half of her life has been colored by cancer. Today, Alicia has become an advocate for others living with cancer, and a voice of inspiration. She is a dynamic and powerful speaker and an excellent storyteller who delivers her message with compassion, wisdom and wit. In September of 2009—at 26 years of age—I was diagnosed with cancer, after experiencing the first of many seizures to come. Of all the trials I could imagine that lay ahead, I never thought most of them would be exercises in recollection. As time progressed; I remember those waiting rooms, questions and ID tags much more than the operating theatre and injections; trauma is kind like that. However, they made me feel intrinsically linked to my disease. What was I, without these suffixes of sickness to identify with? Somehow, all my other unique and admirable qualities were set-aside for the identifier of ‘cancer patient’. It’s easy to resign to the belief that those forms and wristbands define your life, mere statistics, data—you and your cancer. Just as painless, is to ignore the process completely, pretending your exams and operations are the bad dreams of another person, your ‘real life’ goes on unaffected. Either way, it seems you’re not to talk openly about cancer, and it is difficult for most; patients, family and doctors alike. My initial sense was, it would be easier for me—and more comfortable for others—to keep off the topic. Sickness is a surprisingly taboo subject in a very liberal culture. The artist in me, however, couldn’t stop questioning why we hide from the discussion. Over the course of my treatment and the years to follow, the entirety of my work became a continuous, very uncomfortable, conversation about my disease with anyone that would listen. In doing so, I freed myself from the fear and shame that I felt initially upon my diagnosis. It allowed me to speak honestly to an audience on an issue I was passionate about, to relate to others on a level beyond the initial stigma of sickness. I became a proud patient. My work wasn’t about the ‘battle’, ‘fight’ or being a ‘survivor’; the words of conflict I was trying to avoid. The art became focused on the subtle, sincere and even sarcastic aspects of the life-changing experience I was going through. I wasn’t interested in discussing my struggle with cancer; I wanted to embrace the insight it gave me. 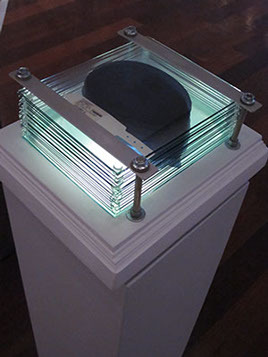 In January of 2014, I exhibited a solo show of this work at the Boston Sculptors Gallery (486 Harrison Ave. Boston). In the month that followed, I was able to engage with patients and the public in ways I was never able to before. My show became a safe space for anyone to talk about this difficult subject. In doing so, stories were shared, wisdom was gained and many tears—of joy and woe—were shed. To all who came, I sought to impart a sense of community and empathy they didn’t enter with. I learned, as a patient I need to speak about my experience with the ‘healthy’ world, regardless of stigma or discrimination. My ultimate healing came through delightful conversations about a horrible problem. Dennis Svoronos’ work exists between art and engineering; it is inspired by the modern world in motion. He uses his sculpture to reflect this environment charged with electricity, spectacle and information. He uses our common language of the 21st century: electronics, robotics and interactive kinetics, to build connections between the viewers and the work. In a society fractured by technology, Dennis Svoronos uses it to bring us together. 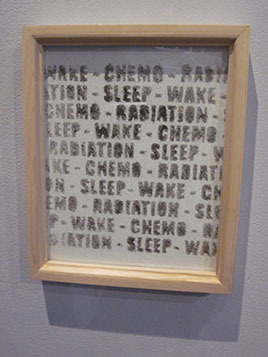 At current, he is making work in response to his recent diagnosis of brain cancer, seeking to use his art as a platform to question sickness, wellness and recovery. Dennis Svoronos is a Boston-based sculptor whose work has been shown nationally and internationally. He holds a diploma from the School of the Museum of Fine Arts, Boston, and a Bachelors of Fine Arts from Tufts University. His work has been exhibited at numerous institutions and galleries such as the MFA, Boston; the Norton Museum of Art, Palm Beach, FL; G.A.S.P Brookline, MA; and the Institute of Contemporary Art, Lake Worth, FL. Svoronos has also been the recipient of numerous awards and public work commissions. Currently, he is living and working in South Boston.